The Miniature Bull Terrier was developed from the larger Bull Terrier, it has always been kept as a companion. The breed was previously known as the Bull and Terrier, Bull-dog Terrier, White Cavalier, or Hink's Breed, after their creator. 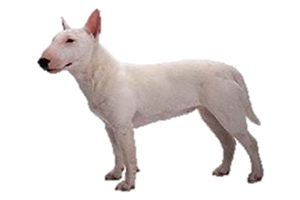 The history of the Miniature Bull Terrier coincides with the larger Bull Terrier, as these dogs were simply bred down from the larger version. They were created from runts that were inbred to produce smaller and smaller dogs. At one point there was an attempt to breed a ‘Toy’ Bull Terrier, but this caused serious deformities and both the Toy and Miniature began to lose favor. In the 1930s Miniatures were attempted again with special efforts to produce a sound animal, which succeeded and resulted in today’s dog. Is the Miniature Bull Terrier Right for You?